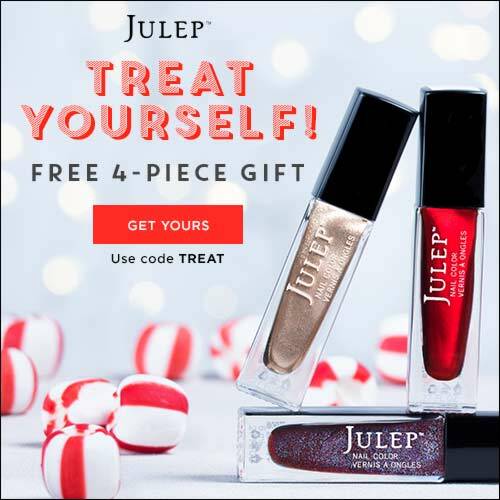 Julep Limited Edition Holiday Maven Box plus Free Box Coupon! Julep just announced it's newest deal for new Mavens!! If you sign up and use the code TREAT, you'll get your first Maven box for free and instead of a regular Maven box, you'll get a four piece Holiday set! The new Jingle Bells Welcome Gift from Julep Maven (a $58 value) has you covered - a bit of shine, a bit of sparkle and a top-rated beauty product as a bonus guarantees that you will be ready! Here is a photo of the Jingle Bells box! Technically, it's not completely free because you have to pay $2.99 shipping but getting these Limited Edition boxes are a great deal because they tend to have more product than a regular box! Then as a Julep Maven subscriber, you'll also get 20% off shop products, free shipping, and access to the secret shop at the beginning of each month. The secret shop is awesome and full of deals and fun, new products. I just spent way too much in the secret shop yesterday. Take the Julep Style Quiz and they'll match you up with a box that fits your style. I'm a Bombshell and I've found it to be spot on each month with what I want. I don't think I even switched anything out for November. Just make sure that if you are signing up for the first time and you want your first box to be free that you enter either FREEBOX (for the normal welcome box) or TREAT (for the four piece Holiday box)!